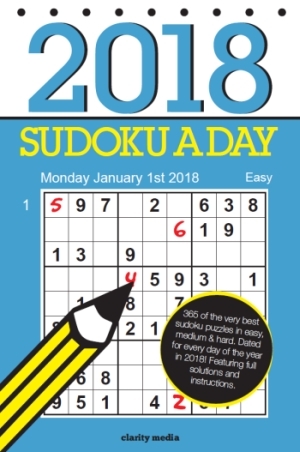 Welcome to this fantastic book of 365 sudoku puzzles, one for every day of the year. If you're looking for a Christmas gift a Sudoku fan or puzzle lover, look no further than this collection of brand new puzzles. Featuring the very best mix of challenging puzzles, staggered in levels easy, medium and hard, sudoku a day contains a fresh challenge for every day of the year. This fantastic collection is sure to keep any sudoku fan on their toes and will even help to train the novice puzzler into a sudoku expert! The puzzles are dated for every day of the year so there's no chance of losing track and with two puzzles a page, there's plenty of room to take notes. If you get stuck along the way, take a look towards the back of the book where you will find all of the solutions to help you. 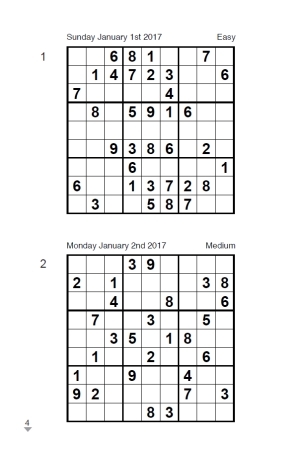 Using these rules you will be able to solve the puzzles in this enjoyable collection of 365 sudoku - of course there are other rules you can use too, but you won't need more than these to solve the sudoku puzzles in this collection.